Founded in 2012, Black Lapel is among the younger online made-to-measure tailors on the market. However, don’t mistake their youth for inexperience. Alternatively, scroll down to read it all! This section provides a quick overview of Black Lapel’s range of services and custom garments. If you want to learn more directly from the brand, you can use the links below. Alternatively, scroll on to learn more following our own research. Black Lapel has also been included as one of our best places to buy custom suits online. Check out our full online made-to-measure tailor guide to view the others! 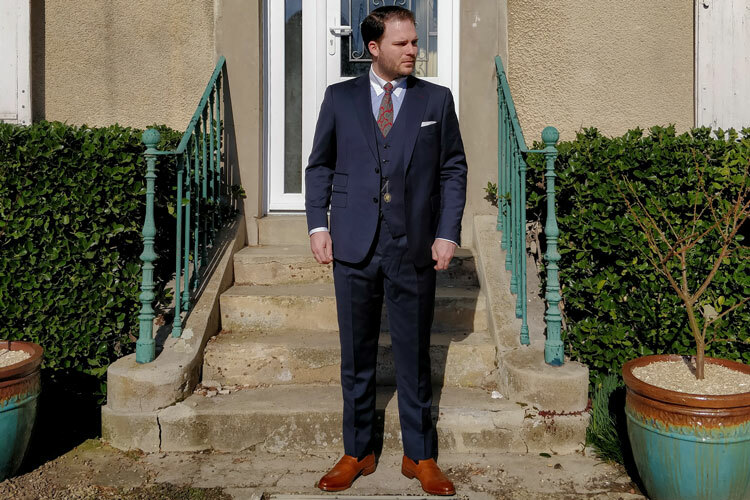 In our review of their online made-to-measure suit service, you will learn that we were very impressed indeed. Therefore, we reached out to Black Lapel to request that they provide our readers with an exclusive discount code to help promote their services. Black Lapel responded! You can now benefit from our exclusive $50 discount from your first order with the code “FTOBESPOKEUNIT” when checking out. Prior to 2012, Derek Tian and Warren Liao worked in New York City’s finance sector. Therefore, suits were something that they both needed to wear on a daily basis. However, as young professionals living in a somewhat expensive city, they both struggled to find suits that were simultaneously affordable and well-fitting but also made from quality materials. In a heartfelt article on Black Lapel’s site, Tian recounts how he used to believe that dressing well meant simply wearing designer brands. Yet, like many people have experienced, he overlooked the importance of the fit. Thanks to Liao, Tian was introduced to custom tailoring. At the time, Liao was a friend with spare fabric and a few contacts in the tailoring trade. However, this discovery of custom garments would soon inspire them to embark on veritable adventure together. Before wearing a custom suit, Tian stated that had never felt pride of ownership in his clothes before. The experience changed his outlook and inspired confidence. While the custom suit was made from a classic conservative fabric, he realised the importance of a flawless fit. Once Derek Tian and Warren Liao had become aware of the importance of the fit, they sought to provide the same experience for others. However, challenges lay ahead. Supplying both a quality fit and fabrics while preserving affordability seemed like an impossible task. Nevertheless, together they persevered and in 2012, Black Lapel was born. Warren Liao and Derek Tian founded Black Lapel based on trust. The brand’s identity is tightly woven with its philosophy that the clothing is about the individual. Given that everyone has a different body type and their own individual morphology, they are adamantly against the standardisation of sizes. Meanwhile, they endeavour that men around the world can confidently place their trust in Black Lapel to provide them with a flawless fit. As well as the fit, Liao and Tian share the belief that the same applies to the aesthetic design of a suit. After all, we all have our own personal tastes. Therefore, they seek to provide men with the ability to design their own unique garments. Everything from the fabric selection to its various features such as the cut, pocket and lapel types can be honed according to an individual’s stature, skin tone and personal preferences. With an obsessive focus on quality, Black Lapel’s team seeks to provide the very best fit, materials as well as the overall experience when purchasing a suit. The brand has heavily invested in these considerations in order to attain the highest standards possible. Their direct-to-consumer model not only keeps their garments affordable but develops a close relationship with their clients. By streamlining the made-to-measure process into an online experience, Black Lapel has created a service that doesn’t require several visits to a tailor nor an entire month’s salary. 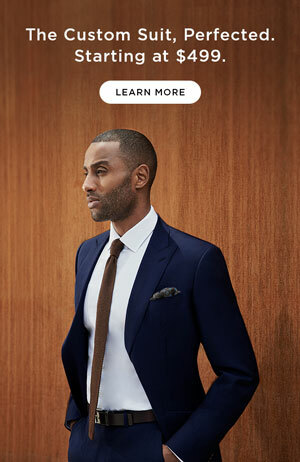 Today, Black Lapel is one of the leading online tailors of men’s custom clothing online as well as one of the best reviewed retailers as a result of this investment. Although we cover the ordering process in greater detail on our dedicated Black Lapel suit review, we also briefly explore it below. Black Lapel also has a showroom in Midtown Manhattan. If clients are lucky enough to live in New York City, they can undergo an authentic made-to-measure experience by booking an appointment. Even if Black Lapel does have a brick-and-mortar facility, physical outlets are not a current priority. While such locations could provide an additional service in the future, Derek Tian believes that their online activities are currently the best use of their energy. After creating an account on the Black Lapel website, clients can begin to put together their measurement profile. Although a similar process to other online made-to-measure services, Black Lapel’s system is arguably more comprehensive. Firstly, clients can choose between imperial and metric measurements, which is a great help for people outside the USA and UK. This can be chosen when first completing their basic height and weight but can be switched throughout the process. Once the height and weight have been applied, clients will then be presented with a series of silhouettes to select their posture. The choices will then calculate approximate measurements based on the height and weight. However, it is strongly encouraged to fill these in manually by following the Measurement Wizard. Each measurement is accompanied by a short video with subtitles and precise overlays for an easier experience. When finished, clients are presented with their measurements, which can be edited and revised individually. Interestingly, the measurements are also separated between garments, which allows clients to make any individual changes. For instance, a client may prefer a snugger shirt but more relaxed suit jacket or overcoat. Finally, Black Lapel also provides clients with the opportunity to upload a selection of photos. This is a unique addition to the measuring process and allows Black Lapel’s tailors to consult the photos for more accurate results. Before an order is processed, the submitted measurements undergo several quality control processes to ensure that they are accurate. They are first reviewed using Black Lapel’s proprietary data-enabled methodology, which scans for any potential anomalies. Following that, expert fitters and a master tailor will review the measurements for areas that may lead to fit issues. If they have any concerns, they either recommend adjustments or integrate any measures into the pattern used for cutting the cloth. Should anything be discovered during either stage of the checks, the client may be contacted in order to double-check his measurements. Extra precautions are placed into first-time clients in order to reduce the likelihood of any eventual fitting issues and subsequent alterations. As Black Lapel prides itself in the interactivity it offers with clients, this is a dedicated part of their service. Consequently, they have heavily invested in measures that ensure accurate measurements that results in a precise fit. Black Lapel uses a similar approach to Indochino where a suit is selected among the collections first before customising its appearance. While their collections are vast, browsing is relatively easy thanks to the comprehensive filtering options. Once a client has found a suit that he likes, selecting it will present the option to customise it manually or automatically. While an automatic customisation is handy for men who are indecisive or in a hurry, manually going through the options is much more enjoyable. While Hockerty favours a 3D interface and Indochino uses a drop-down list, Black Lapel operates from a compromise between the two. Clients are presented with illustrated styling options, which are selected before sliding across and presenting the next ones. The advantage of this system is that unlike other brands, clients will be unlikely to overlook the options available. Furthermore, aside from adding a waistcoat for a comparatively small supplement of at least $99 depending on the fabric, there are no extra charges. In short, all customisation options are included in the service with the only real pricing differences being due to the fabric choice. After the meticulous measurement quality control outlined above, the garment enters the tailoring production queue. The overall process can take between three to four weeks for Black Lapel’s standard half-canvas suits. Meanwhile, four to five weeks should be allowed for their full canvas Savoy Line garments. Black Lapel’s standard suit jacket construction is half-canvassed as hinted above with a slightly padded shoulder. 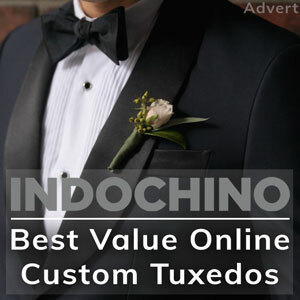 Furthermore, they offer functional sleeve buttonholes and a boutonnière as standard. As for the the trousers, the leg cuffs are cut a slight angle. This latter detail offers a slightly truncated front against the back in order to reduce the break without revealing the heel. To reduce wear, the back of the leg cuff features extra fabric. This not only protects the cuff but also helps weigh them down for an improved drape. Meanwhile, Black Lapel’s Savoy Line introduces a full canvas construction. Yet, there are exceptions to this such as their unconstructed Hopsack blazers and seasonal garments requiring light construction. They also feature additional design and functional characteristics including a gently curved Barchetta chest pocket, a hand-sewn Milanese boutonnière and split back trousers. Nevertheless, both ranges feature a painstaking attention to detail that Derek Tian states may not be noticed by 99% of their customers but will benefit 100% of them. After production, the measurements and fabrics undergo several more inspections at both the tailoring factory as well as Black Lapel’s packaging and fulfilment facilities. Standing by their Flawless Fit Promise, Black Lapel encourages clients to continue working with their tailoring team once the garments have arrived. Like the posture photos during the measurement process, clients can submit photographs of them wearing the garments through the second opinion service. If the tailoring team notices any room for improvement, they will recommend the precise alterations within a quarter inch to achieve the perfect fit. Additionally, clients are covered with a $75 credit for suit alterations by using an alterations form with a local tailor. However, if the suit requires too much work to alter, then Black Lapel will offer a complete remake after returning the original suit. This will require supplementary measurements and exchanges with the tailoring team in order to identify where there were fitting issues. The above steps are key to Black Lapel’s Flawless Fit Promise. The brand’s goal is not that clients own their suits but have garments that fit perfectly. Furthermore, the steps above will allow for the client’s profile to be updated with accurate measurements for future purchases. What Garments Does Black Lapel Make? Although priced slightly higher than their professional business suits, Black Lapel’s made-to-measure tuxedos begin at $599. However, their prices can extend all the way to over $1,000 for their premium Savoy Line black tie options. 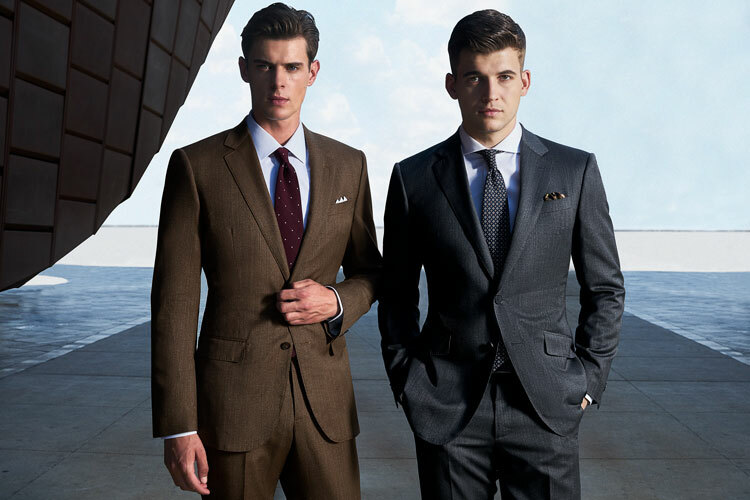 The ordering and customisation process is almost identical to their made-to-measure suits. However, fewer customisation options are available given the dress code’s limited possibilities. Furthermore, there are a number of options available including midnight blue tuxedos as well as contrasting white dinner jackets and black trousers. Black Lapel cater to both casual and formal custom dress shirts with prices starting at $99. Meanwhile, the customisation process offers a selection of collar styles and a wide variety of cuffs including convertible options. Furthermore, both can be made in contrasting colours. Finally, there are also placket and pleat options as well as monogramming on a chosen area of the shirt. Black Lapel also offers a modest yet attractive selection of custom overcoats. While their standard camel overcoat is available for as little as $699, their Savoy Line options are only slightly more at either $799 or $899. Made from premium fabrics, the overcoats can be customised with a variety of button styles as well as notch or peak lapels. Furthermore, the pockets and lining can be personalised with monogramming, ticket pocket, button accent stitching and back strap options. Finally, Black Lapel can produce from a rich selection of blazers that come with various degrees of formality. 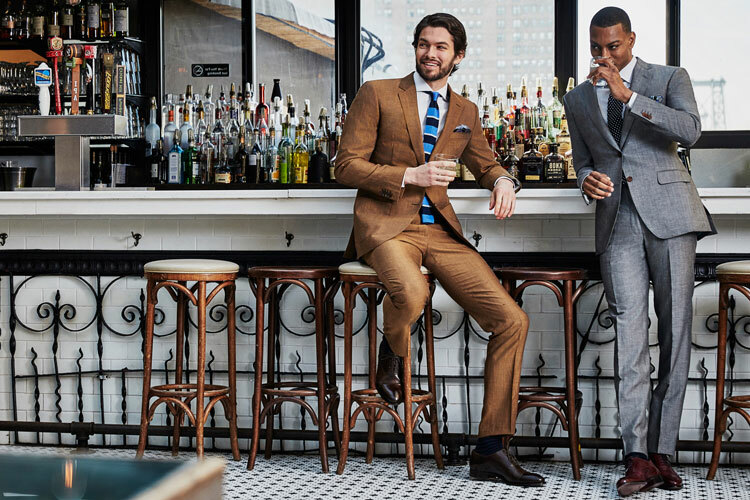 From casual sport jackets to elegant business blazers, there’s something for every dress code. Prices start from $379 and vary according to construction. Furthermore, there are seasonal unconstructed options too as well as the same customisation process as business suit jackets. Black Lapel’s collection of fabrics is growing every day with options for different seasons and occasions. From lightweight linen to heavy winter tweeds, they distinguish their core and premium fabrics only with the Savoy Line mentioned above. You can use the above links to jump down or keep scrolling to view them all. As the name suggests, Black Lapel’s Traveler is designed for the man on the go. Constructed using Delfino’s high-twist Super 130s wool yarn, the suit is resistant to wrinkling. Furthermore, the fabric is liquid repellent for resisting spills and stains. Similarly, it features antimicrobial properties to reduce body odour. Finally, the Traveler also features a range of hidden pockets for your passport and valuables. From Black Lapel’s core collection, their navy suit is an excellent versatile choice. The Super 110s wool’s weight is ideal for year-long wear and the shade of navy is ideal for a range of occasions from the office to weddings. Our favourite choice for the colder months, Black Lapel’s brown Glen Plaid is made using German wool from Saxony. Its heftier weight is still light enough for an elegant drape while the raised nap offers natural insulation to the wearer. Made from 100% Italian-milled cotton sourced from Larusmiani, Black Lapel’s olive suit is a stunning yet affordable summer option. Founded in 1922 by Guglielmo Miani, Larusmiani has been producing and exporting its premium Italian fabrics for nearly 70 years. Between the rich selection of premium fabrics sourced from reputable manufacturers and dedicated tailoring service for precision fitting, Black Lapel is not to be overlooked. While their made-to-measure garments are pricier than some of the other brands featured on Bespoke Unit, the fabric and construction quality is indeed a cut above. Furthermore, they are one of the few to also offer full-canvas construction suits. Nevertheless, their pricing is still comparable to many off-the-rack suit outlets yet offers both a service and experience that justifies the price. As one of the online made-to-measure services with the best third-party reviews, Black Lapel have garnered a strong reputation in the industry. Furthermore, the brand cherishes its loyal customers and listens to their feedback. One of their comments has been that the precision fit only caters to suits, tuxedos and shirts. Consequently, the brand has invested in introducing outerwear. However, Derek Tian has stated that the brand seeks to explore new opportunities and garments for satisfied customers. Reviewed by Charles-Philippe, on 11th December . "High quality fabrics and made-to-measure service. With their dedicated tailoring team and quality fabrics, Black Lapel is a made-to-measure service that warrants your attention."